Armaments: None. Used only for training. Not used in combat during WW1. JN-4 written with an open-top figure four was considered to look like JN-Y, hence the nickname, Jenny. There are differences between accounts of the deployment of the Curtis Jenny. Wikipedia states that deployment was limited to North American bases and none saw combat service in World War I. Both Alan Brown (“The New Forest Aviation School at East Boldre” and “Twelve Airfields”) and Robert Coles (“History of Beaulieu Airfield”) state that Jennys were used at East Boldre and Robert Coles’ book shows a photograph of a Jenny at Beaulieu that lost its undercarriage during a bad landing. He comments that this was one of fifty Jennys at Beaulieu. In East Boldre Village Hall there is a mantelpiece clock fashioned from a propeller hub which is clearly marked “CURTISS”. The Curtiss JN-4 "Jenny" was one of a series of "JN" biplanes built by the Curtiss Aeroplane Company of Hammondsport, New York. The JN series was originally produced as a training aircraft for the U.S. Army but, after World War I, the "Jenny" continued as a civil aircraft and became the "backbone of American post-war, civil aviation. Thousands of surplus Jennys were sold at bargain prices to private owners in the years after the war and they became central to the barnstorming era that helped awaken America to civil aviation through much of the 1920s. Curtiss combined the best features of the model J and model N trainers, built for the Army and Navy, and began producing the JN or "Jenny" series of aircraft in 1915. Curtiss built only a limited number of the JN-1 and JN-2 biplanes. The JN-2 was an equal-span biplane with ailerons controlled by a shoulder yoke located in the aft cockpit. It was deficient in performance, particularly climbing, because of excessive weight. The improved JN-3 incorporated unequal spans with ailerons only on the upper wings, controlled by a wheel. In addition, a foot bar was added to control the rudder. 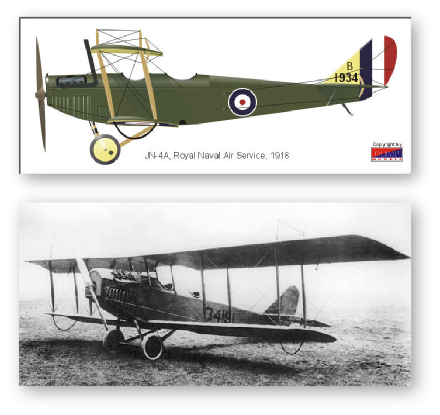 After the successful deployment of the JN-3, Curtiss produced a development, known as the JN-4, with orders from both the US Army and an order in December 1916 from the Royal Flying Corps for a training aircraft to be based in Canada. The Canadian version was the JN-4, known as the "Canuck", had some minor differences from the US version, including a lighter airframe, ailerons on both wings, a bigger and more rounded rudder, and differently shaped wings, stabilizer, and elevators. The Curtiss JN-4 is possibly North America's most famous World War I aircraft. It was widely used during World War I to train beginning pilots, with an estimated 95% of all trainees having flown a JN-4. It was a twin-seat (student in front of instructor) dual-control biplane. Its tractor propeller and manoeuvrability made it ideal for initial pilot training with a 90 hp (67 kW) Curtiss OX-5 V8 engine giving a top speed of 75 mph (121 km/h) and a service ceiling of 6,500 ft (2,000 m). The British used the Canadian version of the JN-4, along with the Avro 504, for their primary World War I trainers. Many Royal Flying Corps pilots earned their wings on the JN-4, both in Ontario and later in winter facilities at Camp Taliaferro, Texas. Although designed as a training aircraft, the Jenny was extensively modified while in service to undertake additional roles. Due to its robust but easily adapted structure able to be modified with ski undercarriage, the Canadian Jenny was flown year-round, even in poor weather. The removable turtle-deck behind the cockpits allowed for conversion to stretcher or additional supplies and equipment storage, with the modified JN-4s becoming the first aerial ambulances, carrying out this role both during wartime and in later years. Most of the 6,813 Jennys built were unarmed, although some had machine guns and bomb racks for advanced training.